Stringers Knob Fire Spotting Tower is an experimental single-pole fire detecting tower erected in 1941. Following the devastating 'Black Friday' fires which swept across large areas of Victoria in 1939, a state-wide search for improved fire detection measures was begun. 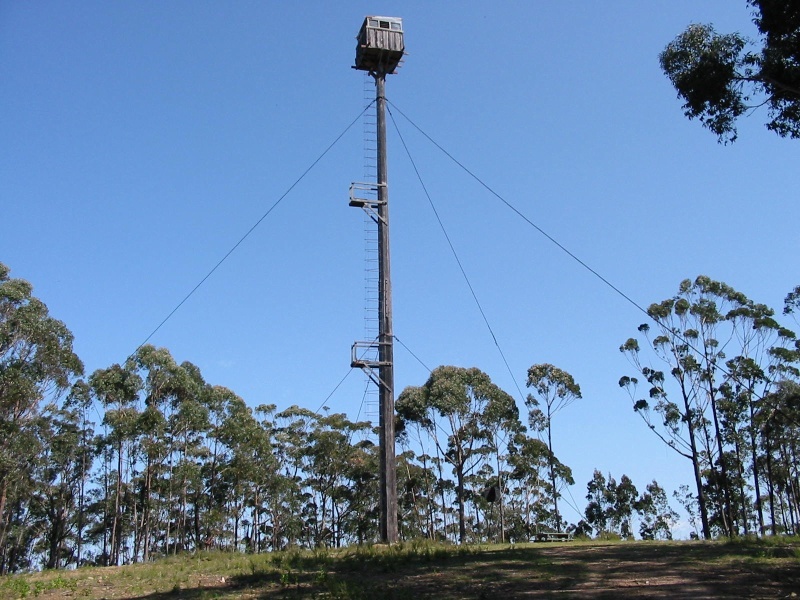 The Forests Commission, given sole control over fire protection and prevention on public land in Victoria, installed a network fire spotting towers and phone lines across Gippsland. Stringer's Knob Fire tower was an experimental design commissioned by the Inspector of Forests in East Gippsland and built by Clem Heather. The height and location of the tower enabled unrestricted views of the surrounding forest as far as Marlo, over 40 kilometres away. The fire spotters were required to spend the week at the tower alone, sleeping in a tin shed at the foot of the tower, and spending the rest of the time in the small wooden cabin atop the pole. Spotters radioed through sightings of suspect smoke. Stringers Knob Fire Spotting Tower was in use until the 1960s. Stringers Knob Fire Spotting Tower is constructed of two poles of yellow stringybark and red ironbark bolted together. The wooden observation cabin, measuring 2.5 metres square, is enclosed on all sides, but the top third comprises windows, enabling a 360 degree view of the State Forest. Access to the cabin was via steel bars on the 28m high pole, and entered through a hole in the cabin floor. Two resting platforms were situated on the pole and the tower is anchored by six cable guys set in concrete bases. Stringers Knob Fire Spotting Tower is of historic and scientific (technical) significance to the state of Victoria. Stringers Knob Fire Spotting Tower is of historical significance for its association with the aftermath of the 1939 bushfires, demonstrating the efforts of the Forests Commission to improve fire safety in Victoria. Its unusual design is of historical importance in the development of safety measures for Victorians. Stringers Knob Fire Spotting Tower is of scientific (technical) significance for its experimental design and unusual construction technique. 1. 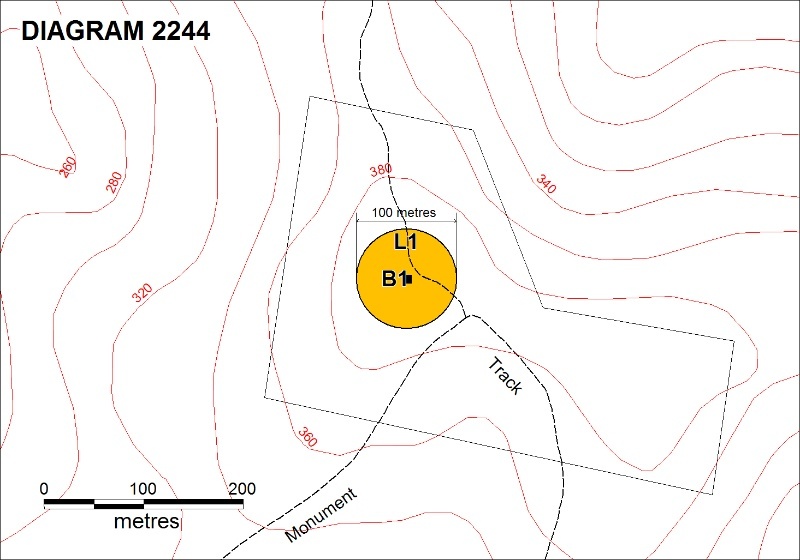 All the land marked L1 on Diagram 2244 held by the Executive Director, part of Crown Reserve P340833 Bete Bolong North, being all the land within a radius of 50 metres of the fire spotting tower. 2. All the structure B1 on Diagram 2244 held by the Executive Director. Following the devastating fires which swept across Victoria in 1939, a state-wide search for improved fire detection measures was begun. Seven major recommendations were made by Judge Stretton at the Royal Commission into the fires, including better cooperation between competing government departments, and more flexible and comprehensible laws of protection and prevention. The Forests Act 1939, which enabled the Forests Commission to take complete control of fire suppression and prevention on public land in Victoria, where previously the responsibility had been shared with the Board of Works. The Country Fire Authority was formed in 1944 to manage fire on private land outside greater Melbourne. Controlled burning of forests during spring and autumn also became an official fire management practice in Victoria. 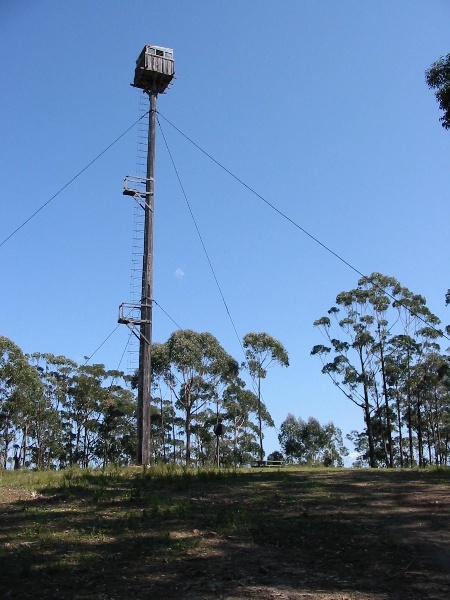 The Forests Commission installed a network fire spotting towers and phone lines across Gippsland. Stringer's Knob Fire tower was an experimental design commissioned by the Inspector of Forests in East Gippsland and built by Clem Heather. With the two trees bolted together, the pole was pulled upright by means of a 35 HP tractor and an elaborate block and tackle system. The height and location of the tower enabled unrestricted views of the surrounding forest as far as Marlo, over 40 kilometres away. The fire spotters were required to spend the week at the tower alone, sleeping in a tin shed at the foot of the tower, and spending the rest of the time in the small wooden cabin atop the pole. Spotters radioed through sightings of suspect smoke. The job of fire spotting did not appeal to everyone. An undated letter (from DSE Orbost), withdraws an application on the ground "After studying your specification for the position, I find I am no longer interested. My commitments compel me to be home each night"
Stringers Knob Fire Spotting Tower was in use until the 1960s. It was noted in 1967 that 'it is unlikely that any more single pole towers will be built as even the Forests Commission has accepted steel as a substitute for wood in the field of tower construction. 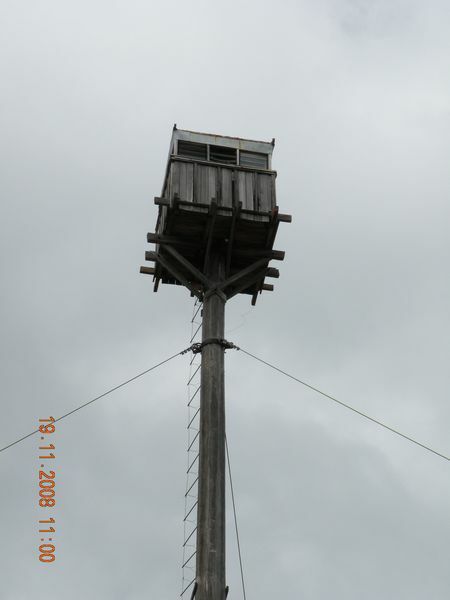 This experimental single pole fire spotting tower was erected in 1941, as the Forests Commission sought to improve fire detection following the devastating 1939 'Black Friday' fires. Fire spotters had unrestricted views of the surrounding forest from the cabin. General Conditions: 1. All exempted alterations are to be planned and carried out in a manner which prevents damage to the fabric of the registered place or object. General Conditions: 2. Should it become apparent during further inspection or the carrying out of works that original or previously hidden or inaccessible details of the place or object are revealed which relate to the significance of the place or object, then the exemption covering such works shall cease and Heritage Victoria shall be notified as soon as possible. Note: All archaeological places have the potential to contain significant sub-surface artefacts and other remains. In most cases it will be necessary to obtain approval from the Executive Director, Heritage Victoria before the undertaking any works that have a significant sub-surface component. General Conditions: 3. If there is a conservation policy and plan endorsed by the Executive Director, all works shall be in accordance with it. Note: The existence of a Conservation Management Plan or a Heritage Action Plan endorsed by the Executive Director, Heritage Victoria provides guidance for the management of the heritage values associated with the site. It may not be necessary to obtain a heritage permit for certain works specified in the management plan. General Conditions: 4. Nothing in this determination prevents the Executive Director from amending or rescinding all or any of the permit exemptions. General Conditions: 5. Nothing in this determination exempts owners or their agents from the responsibility to seek relevant planning or building permits from the responsible authorities where applicable. Minor Works : Note: Any Minor Works that in the opinion of the Executive Director will not adversely affect the heritage significance of the place may be exempt from the permit requirements of the Heritage Act. A person proposing to undertake minor works may submit a proposal to the Executive Director. If the Executive Director is satisfied that the proposed works will not adversely affect the heritage values of the site, the applicant may be exempted from the requirement to obtain a heritage permit. If an applicant is uncertain whether a heritage permit is required, it is recommended that the permits co-ordinator be contacted. Vegetation clearance and management is permit exempt. Fuel reduction programs and fire suppression activities which do not impact on the significant structure are permit exempt. The significance of the place lies in its rarity and intactness as an unusual design of a fire spotting tower, built in the aftermath of the Black Friday fires. All of the registered building is integral to the significance of the place and any external or internal alterations that impact on its significance are subject to permit application.